Grundy tank is a term adopted by the North American craft brewing industry for UK-built pub cellar tanks. These inexpensive, mass-produced tanks were fabricated in the 1950s and 1960s, and have been utilized at almost every stage of the brewing process. The 8.5 [U.S.] barrel (10.1 hectoliters) tanks were originally produced for directly dispensing carbonated beer from pub cellars but have been utilized for fermentation, conditioning, and bright beer storage. 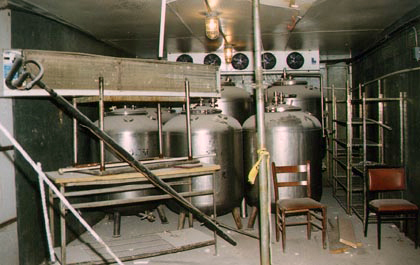 Pictured above are 'Grundy' tanks which were used as beer serving tanks at Sisson's Brewpub, in the Federal Hill neighborhood of Baltimore, Maryland. 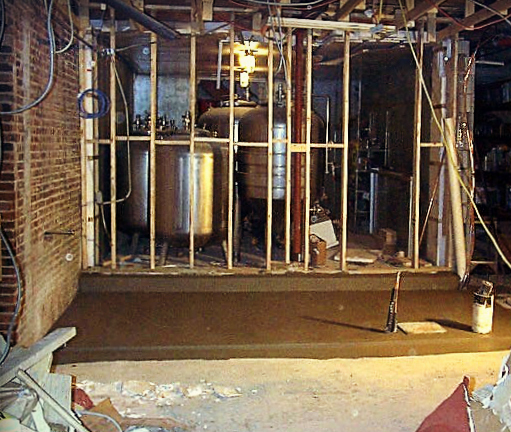 The photo was taken in December 2000, when the brewpub was undergoing renovations. Sisson's had been the long-time pub of the Sisson family of Baltimore, when in 1989, son Hugh Sisson —after successfully lobbying the Maryland legislature to allow brewpubs to operate in the state— installed brewing equipment, and the pub became Maryland's first-ever brewpub (and, in fact, the first brewpub in the entire Virginia, Maryland, Washington, D.C. area). In 1995, he would sell his share of the brewpub, and open Clipper City Brewing, now known as Heavy Seas Beer, just outside the city and still in operation today. But Sisson's? The other family members sold it in 2000; brewing operations ceased in 2002. From this brewer's perspective, Grundy tanks were a pain in the arse. Leaky; never quite holding pressure; difficult to repair or find spare parts. But we still loved them. They were part of our American 'craft' beer beginnings. In the early 1970s a brewery such as Mansfield was putting nearly two thirds of its beer into tanks. But by 1994, changes in tastes had cut that to less than 20 per cent, and tanks were coming out of cellars. Ironically, the demise of tank beer in Britain in the 1980s and early 1990s proved a boon to the growing craft beer movement, both here and, especially, in the United States. Redundant pub and club cellar tanks, cheap and easily available, some of them 50 years old, were converted into fermenting vessels and conditioning tanks in their thousands for new small breweries, and “Grundy tank” became the general term in the United States for imported UK-built pub cellar tanks, even though many were not actually built by Grundy. Caveat lector: As a representative for Select Wines, Inc. —a wine and beer wholesaler in northern Virginia— I sell the beers of Heavy Seas. Any opinions here are mine alone. More images from Sisson's: here. A closer, clearer, view of a Grundy tank, at the Clipper City Brewing Company: here.